The role of positive irrational beliefs (positive cognitive illusions) in mental health has been debated over several decades. The measurement of such beliefs has usually been through inferential assessment, which has been heavily criticised. This paper sought to establish a measure for the direct assessment of such beliefs and to assess their relationship to subjective wellbeing (SWB). Over two studies this new measure was found to have a factor structure consistent with its design, assessing self-enhancing beliefs, beliefs rejecting imperfection, overly optimistic beliefs, and irrational beliefs of control. When combined, these beliefs account for 17.6 % of the variance with SWB. This is driven largely by a higher order factor, which demonstrates a positive relationship to SWB. However, individually the different types of irrational beliefs demonstrate a variety of relationships with SWB. It is therefore concluded that positive irrational beliefs, when directly assessed, provide a greater depth of information than they do when assessed inferentially. Cummins, R. (2010). 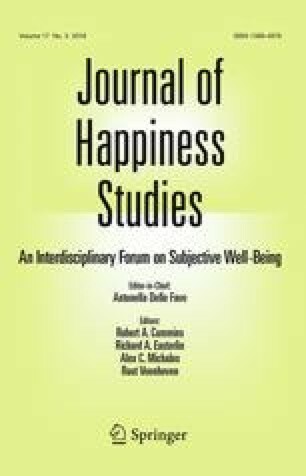 Subjective wellbeing, homeostatically protected mood and depression: A Synthesis. Journal of Happiness Studies, 11(1), 1–17. doi: 10.1007/s10902-009-9167-0. Cummins, R. A., Woerner, J., Weinberg, M., Collard, J., Hartley-Clark, L., Horfiniak, K., & Perera, C. (2013). Australian Unity Wellbeing Index: Report 30.0. The wellbeing of Australians—social media, personal achievement, and work. Retrieved from http://www.acqol.com.au/reports/auwbi.php. Wolff, H.-G., & Preising, K. (2005). Exploring item and higher order factor structure with the Schmid-Leiman solution: Syntax codes for SPSS and SAS. Behavior Research Methods, 37(1), 48-58. doi: 10.3758/bf03206397.